Here are the results of our annual parent survey presented in bar chart format. 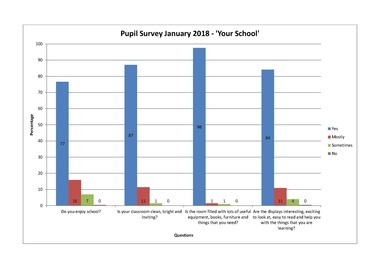 The survey was completed by 133 parents/carers in January 2018. The survey covers three main themes; Care & Guidance, Teaching & Learning and Communication. Overwhelmingly, the results show the vast majority of responses were in the categories ‘Strongly Agree, Agree’. 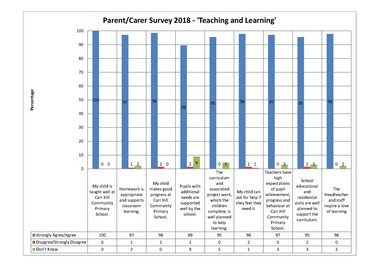 This is indeed a testimony to the hard work of our staff and the really positive relationship we have with the majority of our parents/carers who know the advantages of children attending Carr Hill. 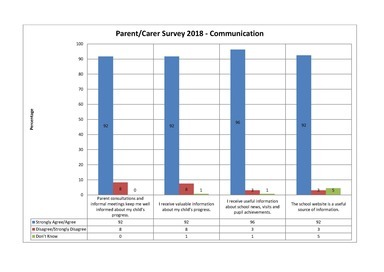 Where we have received comments in some categories (no more than 8 responses indicating ‘Disagree/Strongly disagree’) we have analysed any reasons why a parent/carer should feel their response was fair. 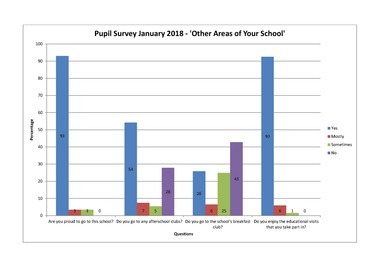 For example, under ‘Communication’ eight responses disagreed with the statements regarding parent consultation meetings and the school providing adequate information regarding pupil progress. 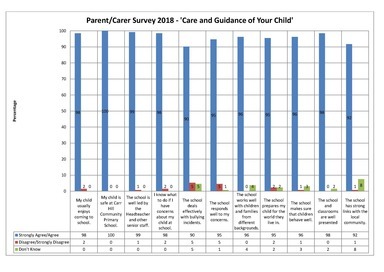 We regard these eight responses to be unfair, given we hold parent consultation meetings, curriculum information sessions, issue comprehensive annual progress reports and operate an open door policy where any parent/carer can meet with a teacher to discuss their child’s progress. Thank you to all parents/carers who responded. You help us to confirm we are working with you and the vast majority of you are happy with the work we do with your children.